That's the moisturiser I use too (got it because my bf's mum uses it too and she defo looks younger than 52):) I also swap between the olay anti wrinkle fluid SPF15 if it's a particularly sunny day although it doesn't absorb as easily as beauty fluid. Anyone could do that with some stick-on gems, I guess, but the concept is awesome! Love this product! My grandma & mom uses this all the time. I've seen this product for years, but stopped using it years ago. Olay has awesome products. I remember my Mom using Olay when I was little. If I use a cream that is too rich I have the same problem and get little whiteheads. I have used Olay Definity cream but it was too rich and didnt seem to do anything for me. I might have to try this. Thanks for testing it out to make sure it was ok to use. my great grandmother used to swear by this! She lived to be 105, and looked amazing! I am def going to go out and buy a bottle soon. I also love the smell of it. I've used this on and off for years, and I dont have a bad word to say about it. I wish the packaging was a little more exciting tho! Thanks for sharing this! I have been looking for a new moisturizer since the one I just bought I really don't like. I am definitely going to give this one a try! I love Olay moisturizer. It's the first one I used when I started moisturizing regularly because my mom's used it for years. I try new ones every once in a while, but I always go back to it :). I love this moisturiser! I've been using it for 10 years (since I was 16) and I have no complaints at all about it. I usually try to get the one with SPF 15 in it and it's great. I've always been told I look much younger than 26 and for that I'll keep using it til the day I die! This is what i also use. it's light, the scent is adorable (slightly powdery, with a hint of vanilla biscuits, i can't say exactly), the benefits are exactly as written on the box and last, the price is very appealing. 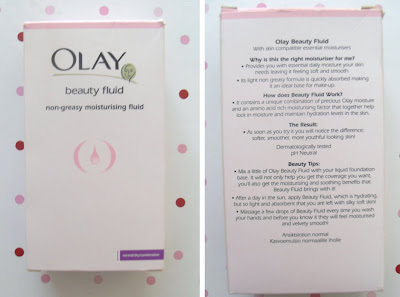 I'm glad people are starting to re-discover the Olay fluid, it's been an award winner for many years. I can't use it as a primer base for the makeup since i have combination/slightly oily skin and need some good product on the forehead and eyelids, but it is definitely a thumbs up moisturizer. This worked better on me than Olay Complete, but it doesn't have SPF so I stopped using it. wow, it was so interesting to read that either their mother, grandmother or great grandmother uses this product. I really enjoyed reading your responses and if you do end up purchasing or using it I hope you really enjoy it. I love olay products !I've bee using 7 anti aging moisturizer for 3 years it really works for me .. am so glad you liked olay too:) woo hoo!! Wonderful information! I will definitely try this. Your Blog is full of great information! It's funny because all this time I was thinking it was some secret expensive moisturizer and now you reveal its olay! I used to use Olay complete but found it wasn't moisturizing enough, [maybe bc of the high spf.] I am running out of moisturizer so I'll be sure to pick this up. I think I will try this when my current cream runs out! I'm seriously thinking about going back to basics with this one. Is there a version with spf? I have been using this for ages! Olay has been my most favorite brand since a long time.Love the dry up feature that comes with it...I mean the feature that lets the skin absorb the moisture creme.